Michael Grab and his Gravity Glue on show at Goalen Head, near Bunga just south of Bermagui. Photo: Gravity Glue. Michael has been on the Far South Coast of New South Wales over summer, bringing his brand of land art to Picnic Point and Goalen Head, a magic bit of coastline between Bermagui and Tathra. “It takes an extreme amount of focus, and patience, and practise to do what I do,” Michael says. His work defies gravity, at least how you and I understand gravity, but Michael seems to have an ability to tap into and read this invisible earth force – something he describes as “gravity glue“. “You line the rocks up in the right way and gravity becomes the glue,” he explains – no tape, cable ties, Blue-Tack, mud, photoshop, or anything. Michael Grab has been finishing his latest Gravity Glue film in a bush studio on the Far South Coast of NSW. Photo: Ian Campbell. 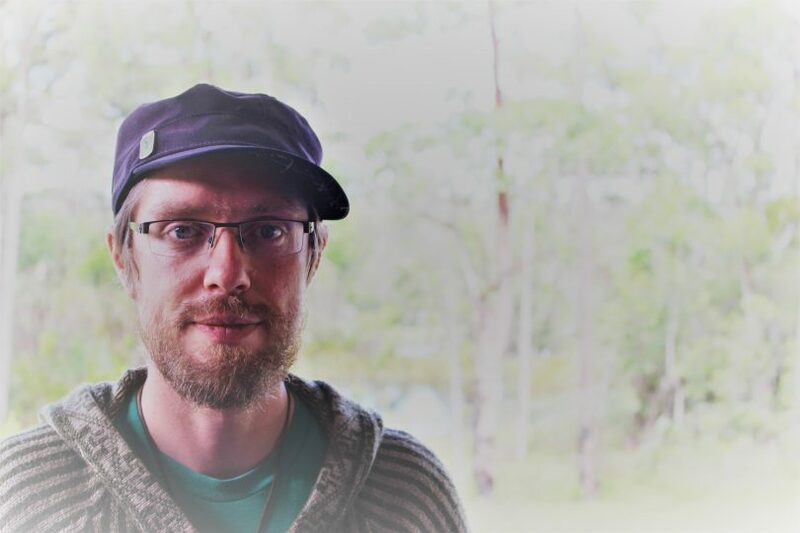 Michael has been using the peace of a friend’s bush studio at Bermagui to finish editing his latest film, which will be released before too long. Vision from Picnic Point will sit alongside images and sculptures he has created around the globe. This thirty-something native of Canada, first discovered “his gift” while playing in Boulder Creek, Colorado after finishing college. He’d been studying sociology and working in a dead end job managing a warehouse. “In my spare time I would hang out at the creek, it was a nice place to hang out on hot afternoons,” he says. Those mind games are still at play now with each new creation. “Just being in nature has a way of tuning the brain into a certain frequency,” Michael says. Land art created at Picnic Point, north of Tathra. “It’s something that I like to make look as impossible as possible,” Michael Grab. Photo: Gravity Glue. “Once I become attached to a rock, then ideas start going off about what kind of proportions or shapes might compliment that rock,” Michael says. Sometimes it’s also about a location, and a desire to create something in that spot. This has become Michael’s obsession. He hesitates at saying he needs to do it, and is more comfortable with saying he really wants to do it. 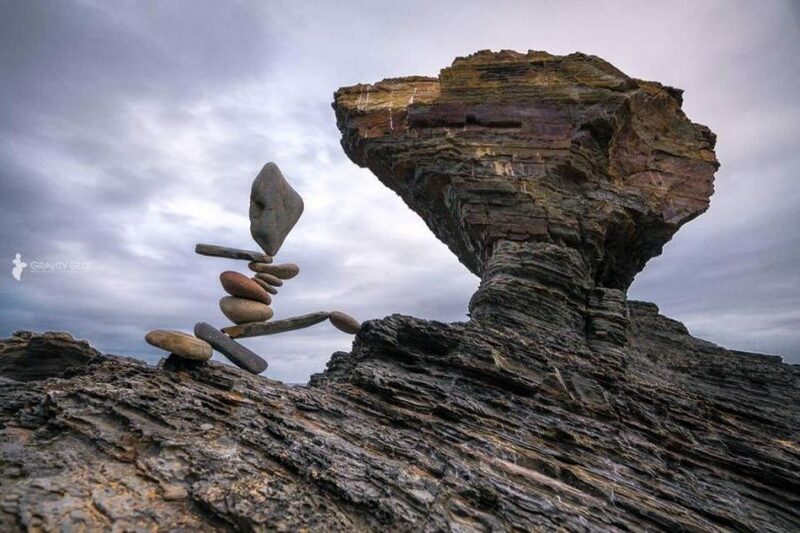 Since about 2008 rock balancing has become his life, his career, his ticket to the world. Michael has balanced rocks everywhere from China, to Costa Rica, to Germany, to Iceland, to Italy, the Netherlands, and beyond. It was a film shoot in Tasmania that got him to Australia. 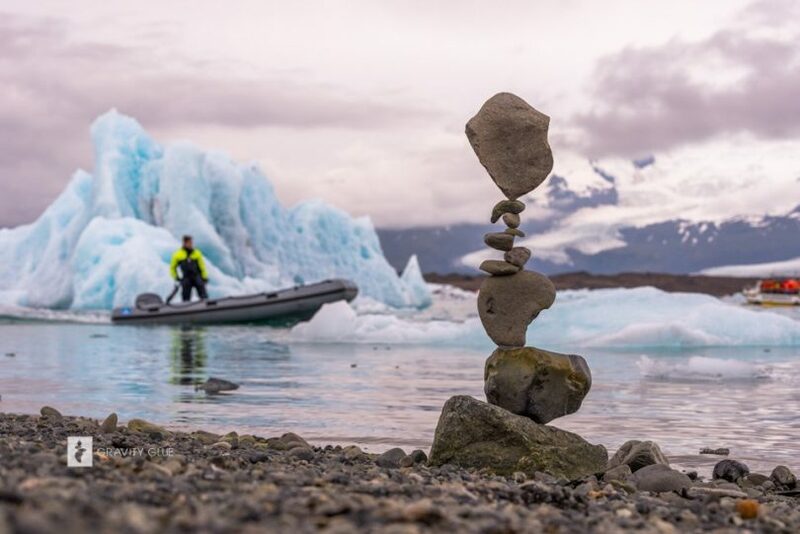 Gravity Glue at work in Jökulsárlón, Iceland. Photo: Gravity Glue. Arts festivals and big business employ him to create art for a live audience. The photos and films of his short-lived works also help build an income. “It’s a profession I’ve completely invented myself so I don’t really have a reference book, I am carving it out as I go,” Michael laughs. But this is not about making a dollar for Michael. There is a sense of spirituality and mental health that is the real pay off. “Before I started doing this I looked at the world in terms of its limitations, this has totally transformed that into an expanded view of what I can possibly do,” he says. 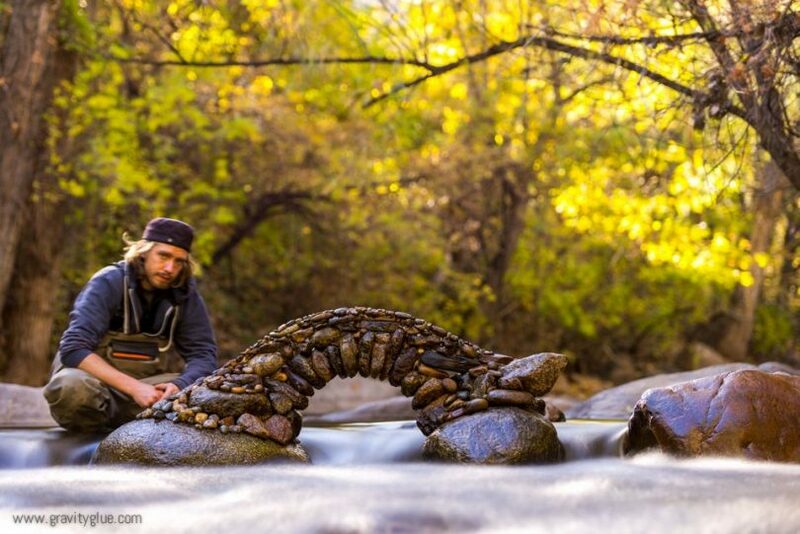 And while he might be the only one in the world balancing rocks to this extreme, Michael believes what he feels when building each of his works is available to anyone. “There are hundreds if not thousands of people around the world that balance rocks, the global community is huge and growing,” he says. A trip to any rocky south coast beach is evidence of that. In the same way that people build sand castles, people stack rocks. “There is a lot of potential to help people and I think it could also be a very useful thing to introduce to children. 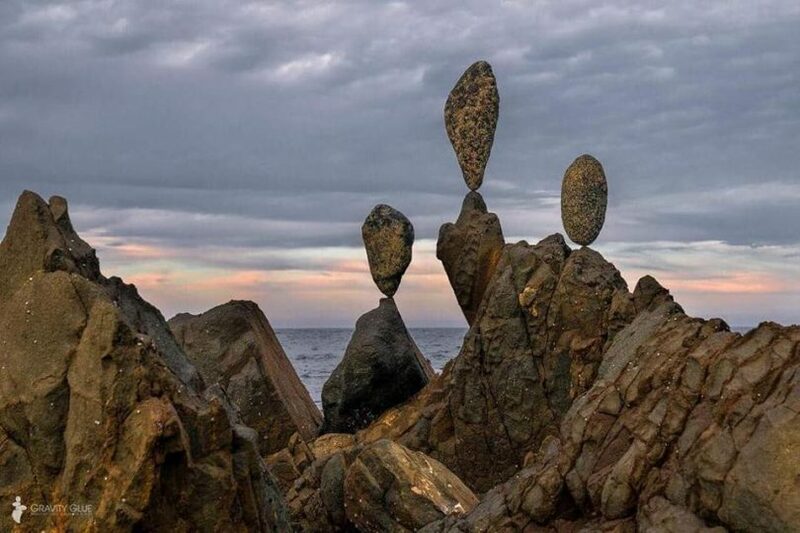 “It [rock balancing] has a clever way of getting the person to focus, it tricks the mind into focusing really hard,” Michael says. The nature of the environments in which Michael works means his art doesn’t last long. If wind, water, and waves don’t bring his totems down first, he will. The disintegration is as much a part of the experience as the creation and viewing. It’s his photos and videos that give each sculpture a sense of longevity and share them beyond the band of bushwalkers and beachcombers that would otherwise be his only audience. “A big reason I like to do it is, that it triggers people somehow and I am not exactly sure how, I feel like the meditative aspect can be transmitted through viewing these things,” Michael says. “A sentient energy is created when you see this impossibly balanced thing that shouldn’t be there. “It just makes people stop and breath and it almost shuts off their mind,” he says. Michael will soon depart for Colorado again, hoping to return to Australia again one day. “I am not really planning anything next, that’s part of this whole thing too,” he says. Michael’s works can be viewed and purchased from the Gravity Glue website. Back home in Boulder Creek, Colorado where it all started. Photo: Gravity Glue.